Accent you dining space or bar area with this delightfully classic pub table set. 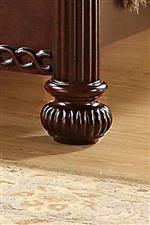 The highly decorative gathering table features fluting designs, woodcarvings and rounded lines. The round shape of the table top allows guests to easily gather around the table. Bar stools include seat cushions and curved backrests for superior comfort. Serve appetizers and beverages on this set, and your guests will be impressed with your beautiful style of furniture that has a Traditional Victorian flair. The Antoinette 3-Piece Pedestal Pub Table & Bar Stool Set by Steve Silver at Walker's Furniture in the Spokane, Kennewick, Tri-Cities, Wenatchee, Coeur D’Alene, Yakima, Walla Walla, Umatilla, Moses Lake area. Product availability may vary. Contact us for the most current availability on this product. 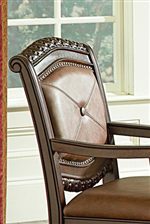 The Antoinette collection is a great option if you are looking for Traditional furniture in the Spokane, Kennewick, Tri-Cities, Wenatchee, Coeur D’Alene, Yakima, Walla Walla, Umatilla, Moses Lake area. Browse other items in the Antoinette collection from Walker's Furniture in the Spokane, Kennewick, Tri-Cities, Wenatchee, Coeur D’Alene, Yakima, Walla Walla, Umatilla, Moses Lake area.